Posted March 28, 2012 by Sage & filed under Media, Recovery, Training and Racing, Yoga. 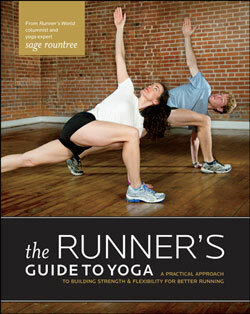 My latest book, The Runner’s Guide to Yoga, is hitting bookstores now. (Please scoot over to Amazon and order yourself a copy!) This book isn’t a replacement for The Athlete’s Guide to Yoga, but it does make a nice complement to that book. My intention for this book is to give runners specific tools from the yoga system that can improve their experience both on and off the course. Instead of containing an exhaustive catalog of poses or exercises, The Runner’s Guide to Yoga presents streamlined poses and exercises for a runner’s body and mind. You’ll find details of yoga poses for the hips and thighs, the lower leg, the core, and the upper body, an extensive section on finding balance in the body, as well as chapters on breathing and meditation exercises. The book also combines these poses and exercises into routines to practice before, during, and after your run, whether it’s a tough track workout, an easy base run, or a long race. And the book is not just for runners, it’s written by a runner and uses models who demonstrate the way these poses look in a runner’s body. The male model has run a 14:45 5K and will run for Stanford in the fall; the female model was on the distance medley team that won the 2000 Penn Relays; I was training for the Mt. Mitchell 40-miler during the photo shoot. We appear super comfortable in some poses and show less than “ideal” form in others. But this is the way real runners’ bodies operate. We carry sport-specific tightness. The goal of our yoga practice isn’t to eliminate it but to keep it in balance so we can stay injury-free and fluid. Beyond that, our yoga practice gives us tools to remain calm, focused, and purposeful no matter what comes our way. Please have a look at the book and let me know how you like it. I’d love a review on Amazon, as well. Thank you! Will it be available on the kindle? Probably not, because there are so many pictures. I hope you'll check out the paper version!